The information below is the official press release for its launch: In the shadow of the Grenfell Tower devastation, Fire Door Safety Week campaigners are renewing their call for a publicly available national register of Responsible Persons for fire safety in rented accommodation. Persons have to ensure that a regular fire risk assessment (FRA) is carried out by a competent person and is documented. “The FRA should examine all aspects of fire safety management, including active and passive fire protection measures, signage, means of escape and the specific fire plan procedures. “Their responsibilities also include acting on improvement advice and creating the emergency fire plan for the building, the key to this is arming the occupants with the knowledge of what to do in an emergency. “Where in-depth and expert knowledge is lacking, the Responsible Person has a duty to engage someone with the relevant expertise to be able to implement or advise on key areas. “There needs to be crystal clarity about the Responsible Person and a total transformation of attitude towards fire safety of tenants in rented accommodation. “By identifying the Responsible Person and providing their contact details, occupants become empowered to report any concerns they have about the fire doors in their buildings. This would also ensure that those responsible for keeping tenants safe from fire know their duty and are made aware of issues directly.” The call for a register of Responsible Persons was first made following the inquest into the death of Sophie Rosser, 23, who died in 2012 following a fire in her block of flats in London. At her inquest, the Coroner was frustrated in her attempts to allocate the blame to any particular person or organisation. Research last year confirmed the BWF’s fears that little has been done to address this problem.More than half of all tenants had no idea who the Responsible Person was for the building where they lived and even more worryingly, two thirds of low income households renting flats had never been given the emergency fire plan information. 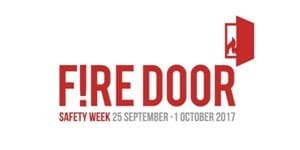 Fire Door Safety Week, now in its fifth year, will run from 25 September to 1 October and aims to raise awareness about the role of third-party certificated fire doors in preventing life changing injuries and the legal responsibilities of managing fire door safety. It will focus on promoting awareness of the critical role of fire doors in high rise buildings, houses of multiple occupancy and other types of shared accommodation. The campaign will be giving advice, hosting events and sharing useful resources. It will also be signposting tenants as to where they should be reporting their fire safety concerns. So far, the campaign has confirmed cross sector support from a wide range of organisations including the fire and rescue services, housing associations, charities, BWF members, fire safety professionals and organisations from every corner of the UK. Further information and advice for landlords and building owners can be found at www.firedoorsafetyweek.co.uk If you would like any advice please get in touch with us here. Alternatively you can contact us on 0800 027 2480. This entry was posted in Building Safety, Community, Fire, Fire Doors, Fire Safety Order, MJ Fire Safety, Protection. Bookmark the permalink.